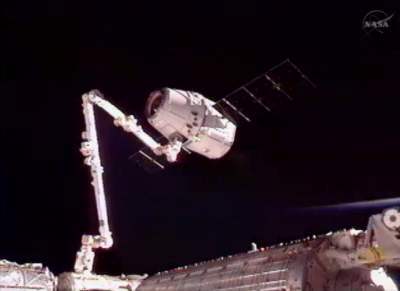 The first private spacecraft – named Dragon – was berthed at the International Space Station (ISS) today, May 25, after being dramatically captured by the astronaut crew earlier this morning using the station’s robotic arm in a landmark event in space history – Dragon is the first commercial spacecraft to attach to the International Space Station. Two hours later, Dragon was successfully attached to the ISS at 12:02 p.m. EDT when 16 motorized bolts on the common berthing mechanism (CBM) latched and locked the cargo vessel to the Harmony module as the giant complex was soaring over the Pacific Northwest region of the US – concluding a dramatic day of momentus space spectaculars. “Looks like we caught a Dragon by the tail !” said a gleeful Astronaut Don Pettit of NASA who plucked the Dragon from space with the robotic arm as it was in free drift about 10 meters from the station. Today’s successful Dragon capture and docking ushers in a new era in the history of spaceflight and will radically change the way we do business in space from this day forward. NASA’s goal is to significantly drive down the cost of transporting cargo and crews to low Earth orbit by using private commercial companies to foster competition and innovation in the free market – much like happened with the airline industry of last century. The Dragon cargo resupply capsule is a commercial spacecraft designed and developed by SpaceX and was flawlessly launched atop a Falcon 9 booster from Cape Canaveral, Florida on a historic test flight on May 22 to become the first private vehicle ever to rendezvous and dock at the million pound orbiting space complex. 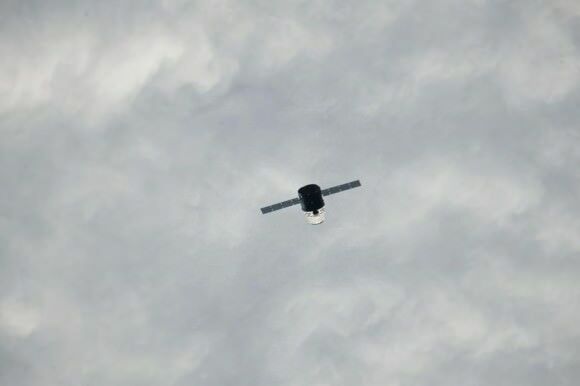 Following a successful series of close approach rendezvous tests on Thursday, May 24, when it flew to the ISS from behind and below during fly-under maneuvers to within 2.4 km (1.6 mi), the commercial cargo carrier was cleared for final rendezvous, grappling and docking today. This morning at about 7 a.m. EDT Dragon was given permission to enter the so called keep out sphere (KOS) which is 200 meters from the station. KOS is an imaginary circle drawn around the ISS that prevents the risk of collision with the massive orbiting lab complex. The ISS is orbiting some 400 km (250 miles) above Earth. 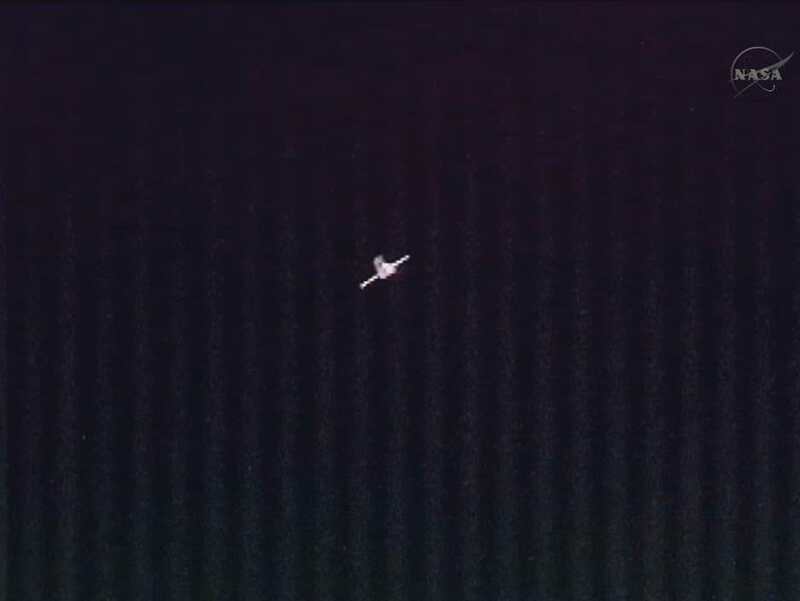 Dragon utilized a combination of LIDAR laser ranging and thermal imagers sensors to determine distance as it closed in on the ISS to the final hold point about 10 meters (30 ft) away for final capture by two astronauts on board at work stations located inside the Cupola dome maneuvering the stations robotic arm. The Dragon’s thrusters are disabled at the 10 meter point to prevent an accidental firing and any undesired movement leading to a potential collision. Dragon was commanded by the SpaceX flight control team based in Hawthorne, Calif, to slowly approach the ISS from below, gradually stopping along the way at ever closer hold points (250 m, 200 m, 150 m, 70 m, 30 m, 10 m) to confirm the crafts position and velocity and that all spacecraft navigation systems were functioning properly to insure a safe capture and berthing operation. Dragon reached the 30 m hold point at about 9:14 a.m. EDT and then had to wait for final approval and before proceeding closer to the station. Dragon arrived at the final 10 m hold point at about 9:45 a.m.
“Crew is ready for Dragon capture,” said ISS Astronaut Kuipers from the European Space Agency (ESA). 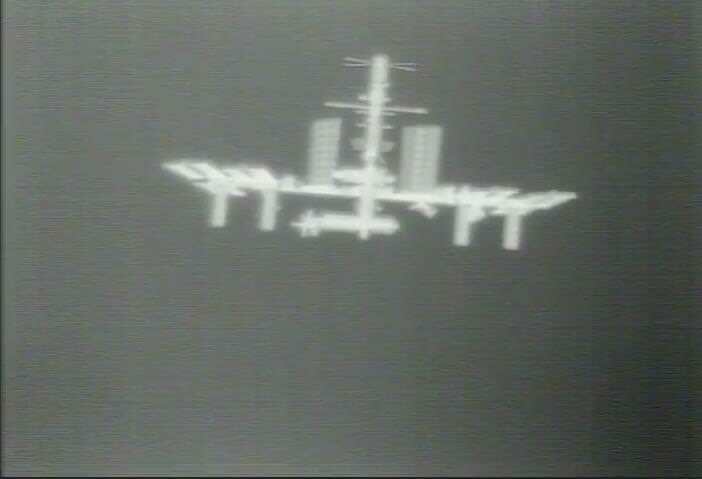 Some stray retro reflections emanating from the external pallet on Japanese Kibo module affected measurements by the Dragons LIDAR system causing a minor 2 hour delay in final approach and grappling as the unit was recalibrated. Indeed one of the LIDAR units was taken offline due to suspect readings but the mission still continued. Since this is a test flight delays are to be expected. Expedition 31 Flight Engineers Don Pettit and Andre Kuipers worked in tandem using the Canadarm2 robotic arm to reach out and grapple the supply ship shortly before 10 a.m. EDT for berthing to the Earth-facing side of the station’s Harmony node later today. Pettit successfully grappled the Dragon with the robotic arm at 9:56 a.m. EDT Kuiper accomplished the berthing a few hours later. Pettit inspected the Dragon’s berthing mechanism with high powered binoculars after the grappling was done and found it to be in good shape for the subsequent joining to the ISS with sign of no damage from micrometeoroids. “It looks like a clean interface,” said Pettit to Mission Control. 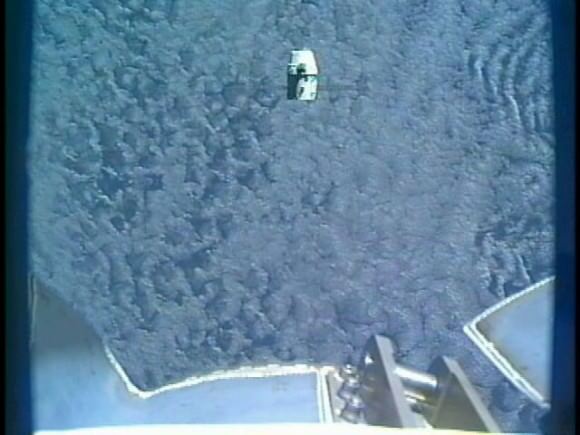 Dragon is scheduled to spend about a week docked with the station before returning to Earth for a parachute assisted splashdown in the Pacific Ocean off the coast of California on May 31 for an ocean retrieval. For this initial test flight Dragon is loaded with over 460 kg (1100 pounds) of non-critical items such as food, water, clothing as well as research equipment and student science experiments. The ISS crew expects to open the hatch and enter the Dragon for the first time on Saturday, May 26. SpaceX has invested about $1.2 Billion in development of the Falcon 9 and Dragon space vehicles and also received about $381 Million in funding from NASA under the Commercial Orbital Transportation Services (COTS) initiative to develop commercial cargo vehicles to resupply the station. Dragon will partially replace the cargo carrying duties that were totally lost when NASA’s space shuttles were prematurely and forcibly retired by US politicians after the final shuttle mission in July 2011. No American vehicle has visited the ISS since the shuttle shutdown. The US is now fully dependent on the Russians to ferry astronauts to the ISS for at least the next 3 to 5 years or more and the gap continues to grow as NASA’s budget is slashed by visionless politicians. SpaceX is under contract with NASA to conduct a dozen Falcon 9/Dragon resupply missions to carry about 44,000 pounds of cargo to the ISS at a cost of some $1.6 Billion over the next few years. 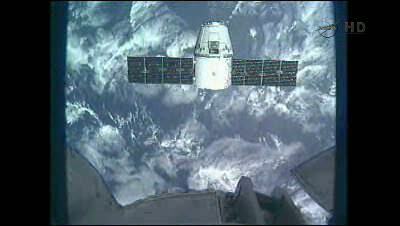 The first operational Dragon resupply mission to the ISS is expected later this year, perhaps as soon as late summer. A mission status briefing was held at 1 p.m. EDT to discuss the day’s activities and all the days momentous events were broadcast live on NASA TV. The high stakes Dragon mission to the High Frontier has been a resounding success thus far and its importance to NASA’s future and the future of human spaceflight cannot be overstated. The wording has me scratching my head… is that “460 kg (1100 pounds) of non-essential items such as food, water, clothing” – and then additional weight in the form of “research equipment and student science experiments”? Or just 460Kg in total for the whole lot? 460 kg for the whole lot. Dragon will partially replace the cargo carrying duties that were totally lost when NASA’s space shuttles were prematurely and forcibly retired by US politicians after the final shuttle mission in July 2011. And now SpaceX has a contract to launch 12 resupply missions for the cost of a single shuttle lauch. Methinks the shuttle program was actually canceled a little late, by perhaps 20 years or so. You should compare this with the payload of one shuttle launch including the number of people that they sent up. Plus the additional bonus of making the astronauts do interesting things in space while they are up. So how many SpaceX launches would be needed for the complete shuttle payload and 6 astronauts ? Spaceshuttles huge strength was its payload volume of 4.6 by 18 meters. Anything else is beaten by SpaceX, even if you need 5 launches for the same payload + crew. Five launches is what I got too, although depending on how the trunk is used you could come pretty close with four. But this is all due to the use of dragon (not specifically a cargo vehicle) to dock with the station. If it were just launching crew, it could do it in a single launch, alternately its payload to LEO falcon IX can almost match the space shuttle in two launches, so replacing the shuttle for non-ISS purposes it is even more efficient. If it weren’t for this fact, there would be no ISS or Hubble; not sure if a heavy LV would have accommodated Chandra but she’s up there because of STS. It is difficult to understand the basis for these claims. Why would launching spacecrafts by private companies be any more worrisome than, say aircrafts? To make profits a private company must serve its customer base. Customers will now likely include more safety concerned tourists. And the desire to go to resuables will likely increase safety as per launch basis. I also note that spacecrafts (or aircrafts) owned and used by governments are manufactured by mostly the same private companies.